Now that we're getting closer to Halloween, what better time than now to try our hands (or nails) at some Halloween themed nail polishes. The Nailbox September edition, named Creepy Colours, features spooky shades to help you on your way. This month was the first ever occurrence of already owning a polish in the box. It had to happen sometime didn't it? Not to worry because the Nails Inc Queen Victoria Street is one of my favourite green shades so another bottle is definitely welcome. Also this month there's been a couple of brands new to my nail drawers including the Sinful Nails Pro Shine in Show Off, a gorgeous metallic purple. Admittedly doesn't look like the most high quality of polishes but the colour payoff more than makes up for that. Another new brand to me is the True Brit London Polish in Taxi Cab, a dark glossy black. I don't really reach for black polishes very often but with Halloween coming up, there's no time like the present. Once again Elegant Touch features in the box with the Elegant Touch Nail Apothecary Toughflex Base Coat. I'm one of these people who are terrible at applying base coats so maybe this will encourage me to use it! I would like to see something a bit different next time however as we've had about 2 or 3 of these products already. 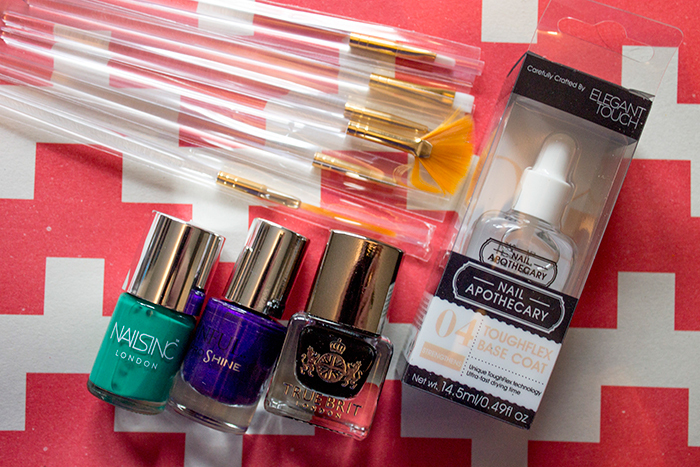 An addition to the box I really liked was the set of Nail Art Brushes which I don't actually own a set of myself! I can see myself creating some sort of design with the black and purple shades in the box with these brushes. Overall, I really liked the colours chosen for this box, though I was expecting them to go down a different angle. I would have expected something like glow in the dark polishes or Halloween themed nail plates but overall, all these shades are very wearable, even outside of the Halloween season. It's safe to say, I'm continuing on with my subscription.